Waffles, waffles, wonderful waffles! I've really been on a waffle binge lately ... beet waffles, vegan waffles, vegan gluten-free waffles, oatmeal waffles, buttermilk waffles. And I've loved every one of them. This particular one is probably the family favourite. The aroma of the oat flour is just very inviting. And paired with fruits du jour, it makes for a very indulgent breakfast or brunch. I'll admit, it's probably an appliance fever. LOL! Ever since I got the deep pocket Belgian waffle maker, Ive been churning out all sorts of waffles. It makes thin and crispy tall walls with deep pockets to soak up all sorts of fruits and fillings. It's huge and chunky and oh-so-rich, it's those kind of waffles you pay extra money for in fancy restaurants. Not your IHOP waffle, baby! Whether you've got a deep Belgian waffle maker or a sweetheart waffle maker, this recipe is one you should add to your breakfast or brunch repertoire. 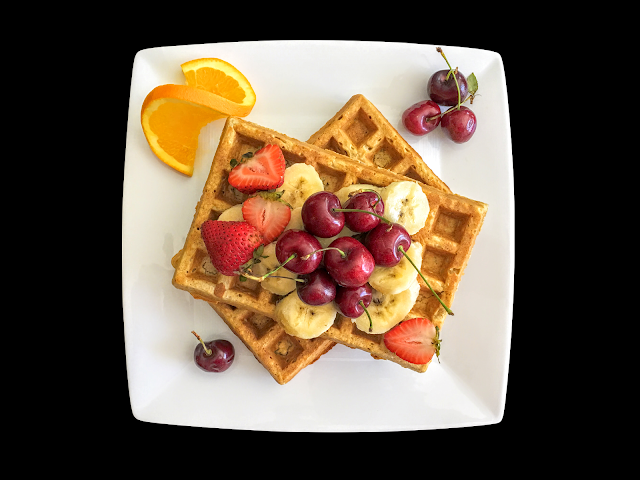 I can almost guarantee you won't be satisfied with your plain Jane waffles once there is a more nutritionally satisfying option as this. 1. In a large bowl, whisk together the oat flour, baking powder, cinnamon, and salt. 2. In a medium bowl, whisk together the milk, cooled butter, eggs, maple syrup, and vanilla. 3. Make a well in the centre of dry ingredients, then pour the wet ingredients into it. 4. Mix until just combined, the batter will be quite lumpy. 6. Preheat your waffle maker and brush a teensy bit of butter or vegetable oil on the plates. 7. Start cranking out these awesome babies. Enjoy with seasonal fresh fruit.